Growing up, James Townsend didn't have much. His father lived behind the grey walls of Folsom State Prison and his mother's salary barely covered the expenses of raising four children. The family relied on food stamps and lived in Section 8 housing in a part of Sacramento where crime and drugs were rampant. If statistics were to be believed, Townsend walked a narrow path between following in his father's footsteps and the successful future his mother, Marilyn Townsend, envisioned for him. Then, as an 8th birthday present, his mother enrolled him in a Salvation Army basketball league where the young boy not only found his passion but a series of coaches who taught him about life both on and off the court. Today, the 20-year-old Townsend is a standout basketball player at UC Santa Cruz with a 3.3 GPA and the goal of working to reform inner-city schools. "James didn't let where he was from stop him," said his mom. "He actually used it as fuel." Townsend (Oakes '15, politics and education) is an imposing figure at a muscled 6-foot-4. His speech is sprinkled with references to hard work, time management, and success. "An old soul," and "a Renaissance man" is what his coach, Ron DuBois calls him. "Not having a dad hurt me a lot," said Townsend whose father was in and out of prison from the time the boy was 5 until two weeks before he graduated from high school. "I missed out on the things a dad is supposed to teach his son." But thanks to basketball, the hole was filled by a series of coaches who taught him about hard work, perseverance, and controlling his emotions. "I liked that control," Townsend said. "It helped me in school and it helped me in life." By the time Townsend went to the basketball powerhouse Sacramento High School, he was a skilled and aggressive player known not only for his rebounding skills but also for his knowledge of the game. "If someone was better than me skill-wise," Townsend said, "they didn't know the game better than me." Ask Townsend about highlights from his high school career, however, and he won't talk about his own stats or a game-winning shot. Instead, he'll describe the time he dove after a flying ball and managed to fling it back inbounds as his body slammed to the floorboards, allowing his teammates to tie, and eventually win, a championship game. "As a captain, James really embodies all the things we are about," which is trust, brotherhood, and awareness, according to UCSC second-year coach DuBois. "It's really an honor to coach him." 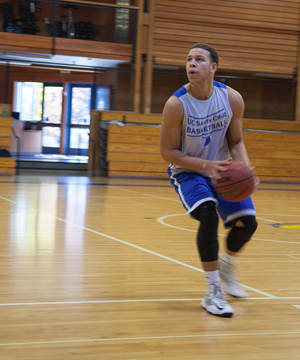 A versatile player, Townsend has left his mark on UCSC's men's basketball team. He averages 13 points and 7 rebounds per game and said he wants to play a major role in instilling a winning culture in Slug basketball that will draw fans not only from campus but also from the community. But it was an education, not just basketball, that brought Townsend to Santa Cruz, he said. Lured by $15,000 a year in merit scholarships, Townsend arrived at UCSC with the idea of going into politics like his role model Kevin Johnson, a former NBA player from Townsend's old neighborhood who is now mayor of Sacramento. After his freshman year, Townsend changed his mind. His goal is now to work to reform inner-city education where, he said, a lack of resources, second-class teachers, and a dearth of mentors can hamper a child's chance of success. He wants to find ways to make kids believe in the value of school, to break out of the cycle of poverty, incarceration, and drugs. "If you lose hope in school, you're on the streets," Townsend said. "And nothing good happens on the street." Losing hope is something Townsend has fought against most of his life. There were times, he said, when he wondered why bad things seemed to happen to him and his family. Why his father was in jail. Why he couldn't have nice things. "If you focus on why things aren't going right…then you focus on negative things. It's harder for you to get back on track," Townsend said. "I've learned to accept those things that are negative and focus on what I can control, the positives." The things he can control, he said, are his grades, basketball, his job as a student supervisor for UCSC's Office of Physical Education Recreation and Sports, and the goal of changing the lives of inner-city kids. "It's my job to do the best with the cards I'm dealt," he said.